Grimes Glen Falls is the primary waterfall found along Grimes Creek within its namesake glen. The falls drop a total of 47 feet in a veiling horsetail type form, with the water splitting around a protruding knob for much of the year - part of the stream veiling smoothly and evenly down the cliff face, but the majority of the flow funnels down a twisting chute that makes a fascinating roostertail formation about halfway down the falls (which is difficult to truly appreciate without getting up close to the falls). Boot paths climb up to the top of the falls with the aid of some ropes, but the boundary of the park is situated immediately upstream of the falls, and continuing further upstream would involve trespassing on private property. 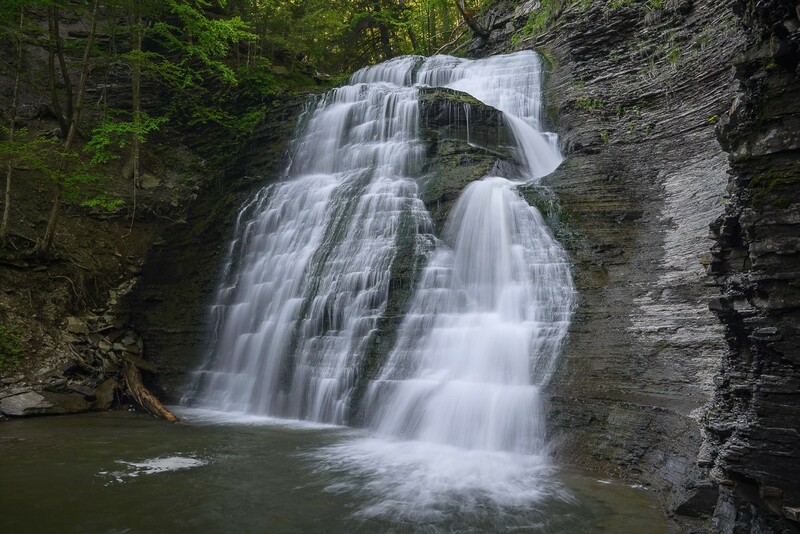 Grimes Glen is a popular area on warm days for locals to cool off, so don't expect to be alone at the falls. Grimes Creek has a drainage area of approximately 13 square miles, and thanks to the presence of several small ponds and wetlands near its headwaters, it retains a relatively healthy volume throughout the year, even when other nearby streams are nearly dry. During our survey in May of 2018, the creek was running quite full, which made getting to the falls without getting wet essentially impossible. Later in the season access to the falls with dry feet becomes a much more likely scenario, and the falls should still present themselves quite respectably. Grimes Glen Falls is the Colloquial name of this waterfall. 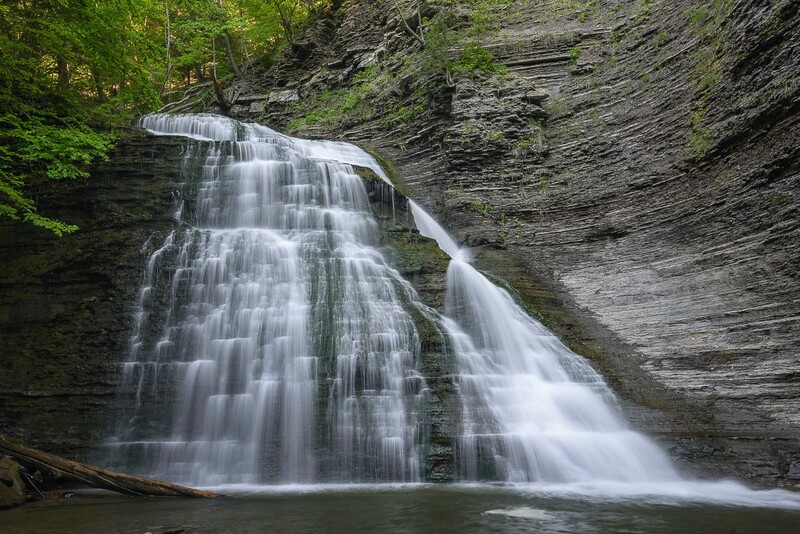 Grimes Glen is found just outside of the town of Naples, south of Canandaigua Lake. From the intersection of Routes 21 and 53 at the south end of Naples, go north on Route 21 for half of a mile, then turn left onto Vine Street and follow Vine Street for another half of a mile to the entrance to Grimes Glen Park at the end of the road. From the parking lot, follow the trail across Grimes Creek and head upstream. The trail slowly peters out into boot paths and the trek to the falls turns into a creekwalk by the time it reaches Springstead Creek Falls after the first third of a mile. Grimes Glen Falls is encountered half of a mile from the parking area. Fording Grimes Creek (usually not more than shin deep, but there are some pools that are as much as thigh deep) several times makes travel upstream considerably easier, but it is possible to get most of the way to Grimes Glen Falls without getting too wet - wear a good pair of water shoes and it's an easy walk the whole way up.